Tom Brady and Bill Belichick aren't prone to making bold proclamations. So we'll do it for them. After beating the Seahawks in Super Bowl XLIX, Brady is the greatest quarterback of the Super Bowl era. GLENDALE, Ariz. -- Tom Brady wouldn't say it. Some of his teammates did, but few definitively. So I will say it with 100-percent certainty. Tom Brady is now the best quarterback to play the game since they started playing Super Bowls. It's too hard to say he's the best of all time, considering how the game has changed and few saw the greats like Otto Graham chuck it around and win titles. But since the league started playing for these big silver trophies, now called the Lombardi Trophy, it's hard to argue against Brady being the best of all time. Brady stated his case as the best with his best Super Bowl performance of them all Sunday night, leading the Patriots back from 10 down in the fourth quarter to defeat the Seattle Seahawks in a dramatic 28-24 victory. Playing in his record sixth Super Bowl, Brady won his fourth title, tying Joe Montana and Terry Bradshaw, by completing 37 of 50 passes for 328 yards, four touchdowns and two picks. He earned his third Super Bowl MVP, also tying Montana. It was the way he did it that seals the deal as him as the greatest. He did it against the best defense in the league, arguably the best of all time, and he did it by going 8 for 8 for 56 yards on the game-winning drive, throwing the winning score to Julian Edelman from 3 yards out with 2:02 left. When the Patriots picked off Russell Wilson in the closing seconds on their 1-yard line, ending one of the most dramatic Super Bowls ever, it sealed the deal for Brady being the elite of the elite. "Well, I haven't thought about it," Brady said about winning four titles. "I never put myself in those discussions. That's not how I think." It's how we think. That's the fun of sports, sitting on a bar stool arguing the bests of the best. It's hard to argue against him. Don't mention Spygate or Deflategate, either. That matters none when talking about him being the best. There are a lot of reasons to make that claim. Consider that both Bradshaw and Montana won titles in eras where greats stayed on teams and free agency wasn't an issue. Brady won his fourth title 13 years after his first, while Bradshaw won his fourth five years after his first and Montana won his fourth eight years later. Not only that, but Brady is doing it in an age of specialized and exotic defenses, nickels, dimes, complicated fronts and looks. Back when Bradshaw and Montana did it, the game wasn't as complex. After the game, Brady was asked if his game-winning drive was similar to his first Super Bowl-winning drive 13 years ago. He chuckled. "Hard to remember that far back," Brady said. "I am a little bit older now." This one had to be sweet, even if he didn't say so. Four games into this season, the vultures circled over his head. He was taken out of a blowout loss at Kansas City on national television as the Patriots fell to 2-2, and there was actually a chorus saying it might be time to sit him down. It was foolish to say it then, and it's even dumber now. Brady is a quarterback assassin, cool and calm -- even when down 10 against a great Seattle defense, he never flinched. The biggest and best throw of the night came on third-and-14 from his own 28 with 10:58 left and trailing by 10. Brady stepped up in the pocket and fired a rocket to Edelman for 21 yards and a first down. The Patriots would finish the drive with a 4-yard touchdown pass to Danny Amendola. That set the stage for the dramatic ending. First it was Brady making his drive to go ahead 28-24, and then the pick on a questionable decision by the Seahawks and Wilson to throw it with Marshawn Lynch in the backfield. That shouldn't take away from the real story, which is the coronation of Brady as the best of all-time. He won this one with his patience, a must against the Seattle defense. His longest completion was 23 yards, and he completed 11 passes to running back Shane Vereen. No hero syndrome here. When Brady won his first, I foolishly called him a game manager. I didn't think he had this special ability. I thought he was a product of a good team. That changed quickly. The team became his, the success sustainable because of him. It used to be we had the Peyton Manning-Tom Brady debate. Now the debate is Brady-Montana. But considering the era and how he won his fourth, especially after losing two heartbreakers, how can he not be the choice? Think about this: Two dramatic, last-minute losses against the New York Giants or he might be sitting with six Super Bowl titles. Then there would be no argument at all. As he walked off the podium, slowly I might add, all I could think of was there goes the best quarterback of the Super Bowl era. Brady looked spent when he met the media. He battled flu-like symptoms this week, and he clearly seemed to have some residue. His voice was raspy, his manner lethargic, far different than when he won his first three. "Yeah, I am tired," he said. Maybe it's all he has battled to get here this season, the talk of not winning since Spygate, the talk of his benching, the inflation of footballs, all of it. "Tom's the best ever," Edelman said. "I am a big Joe Montana fan. Love him to death. I thought he was the best at everything. He won four. He's undefeated in four. But they didn't have a salary cap back then. Tom Brady has won four with a salary cap. It's hard to argue against that." So don't. Just say it. Move over, Joe Montana. 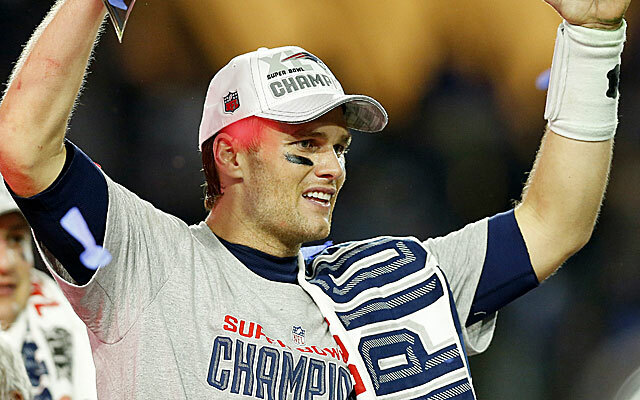 Tom Brady is now the king of the Super Bowl quarterbacks.